WANNA GROW YOUR HORNWORMS BIGGER? Get 1 Hornworm Cup w/green food (original green worm) PLUS One Cup w/Mesh & Green Chow to continue to grow your hornworms to larger size! Price includes USPS Priority Mail shipping. 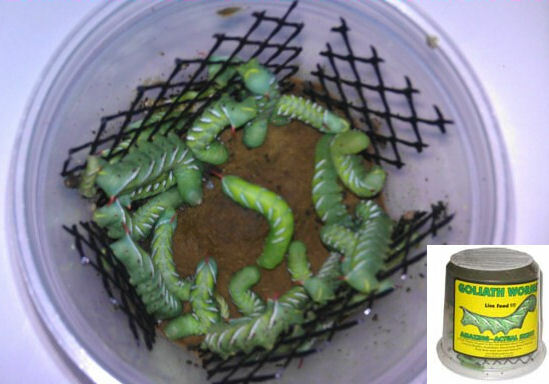 Self contained and easy to maintain, our Hornworm Cups make keeping fresh feeders on hand easy!! IF YOU HAVE A SIZE PREFERENCE FOR YOUR WORMS (we can ship hornworms up to 2" in length, larger if shipped overnight -- these worms will grow quite a bit during several days in transit, especially in warm weather), please remember to place size requests (be as specific as possible!) in the "special instructions" section (during "checkout") when ordering ... we will do our BEST to accommodate your size request as closely as possible.